Just Jen's Boneyard | Fun stuff from Cleveland Street & Beyond! Yep, that’s right, today, on Halloween, I give you 2018’s Halloween!!! Michael Myers has come back for 1 more go at the lovely Laurie Strode, the girl who got away!!!! But this time, she’s ready for him!! Now let’s be clear, I have not enjoyed any of the sequels to the original 1978 masterpiece, Halloween 3 being the only exception. All the others have sucked for one reason or another. When I first heard about this rebirth, I was skeptical, then I saw the trailer and my heart raced with excitement!! That bathroom stall, teeth scene, made me cringe with delight!! So, needless to say, my expectations skyrocketed! We find Michael Myers, having been captured shortly after his and Lauri’es showdown, in a mental asylum, about to be transferred. Having never spoken a word in that 40 years, his new doctor is fascinated by him, and now 2 journalists are interested in doing a piece about the “Babysitter Murderer”. We instantly are on edge, we can sense Michael’s desperation to finish the job he started so long ago. Obviously we get the “chase” we’ve been waiting for, as Michael makes his way through Haddonfield one more time, with Laurie on his mind! Dealing with one hell of a case of PTSD, Laurie, having alienated herself from her family, has been living her days obsessed with never being caught of guard again. Again, we obviously get the showdown the movie has been building up to. Laurie and Michael together again at last, so the final time, winner take all!! So as the audience member, I got all I expected to see, Michael slaying some neighbors, a couple teens, and causing widespread panic to the town he scarred so many years ago! I was even delighted to see a few homages to the 1978 original, flipping the script and putting Laurie in what was Michael’s place a few times, even the masks from Halloween 3!!! 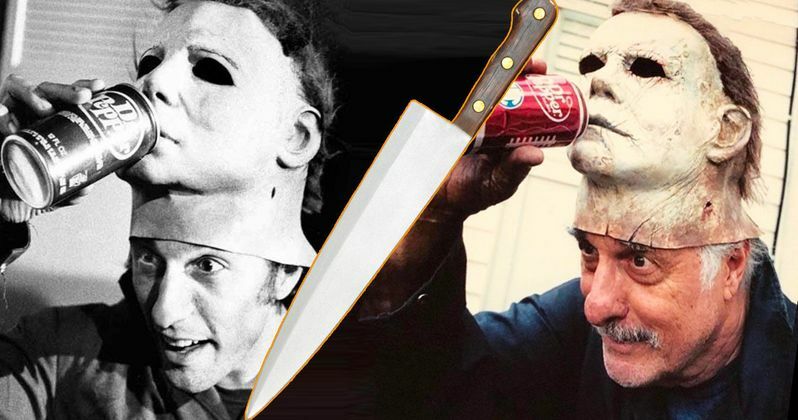 I love the fact that they got Nick Castle, the OG “Shape” to play the part, and help guide the other actors playing the role of Michael. I loved the new design of the mask, just a bit of aging on the original was all it ever needed. I like that John Carpenter came back to lend a hand at getting the tone right, but the movie was severely lacking in that sweet John Carpenter music that was so iconic and crucial in the original! As fun as these Easter eggs were, the film felt a little weak in some areas. GET READY HERE COMES MY HONEST, I”M SURE UNPOPULAR OPINION!!! LOL!! I felt that too many of the kills happened off screen, which I know is an old trick to help save a tight budget, but this budget should have been ample enough to give me the kills I’ve been waiting for. I also know the original didn’t really show blood, but I didn’t wait 40 years for a bloodless slasher flick!!! I also think the movie played more like a revenge horror flick than the slasher flick that I feel I was promised. Not that I am not all for GIRL POWER, we all like to see a final girl, but a final girls scene? It felt a little to saccharine for me in the end. As entertaining as the homages were, I felt it was a little too predictable, and lacked the tension and originality I had wanted to be brought to this epic effort. This movie deserved so much more love, gore, and scares, and it just didn’t deliver. It’s worth the watch for Halloween fans, but don’t let the trailer get you hyped, you will be disappointed! Well, that’s all for this Halloween you guys!! Thanks so much for sharing it with me and I hope you had a fabulously fall-tastic October!!! Tomorrow the big day, the most beloved, creep-tastic, day of the year, and to celebrate I bring you, 2018’s Apostle!!! Apostle is an 18th century gothic period piece filled with all the creeps and crawls we want from our horror. Thomas Richardson, Dan Stevens, has returned home, after being thought dead, to find his only sister has been kidnapped by a secluded island cult in hopes of collecting a ransom. 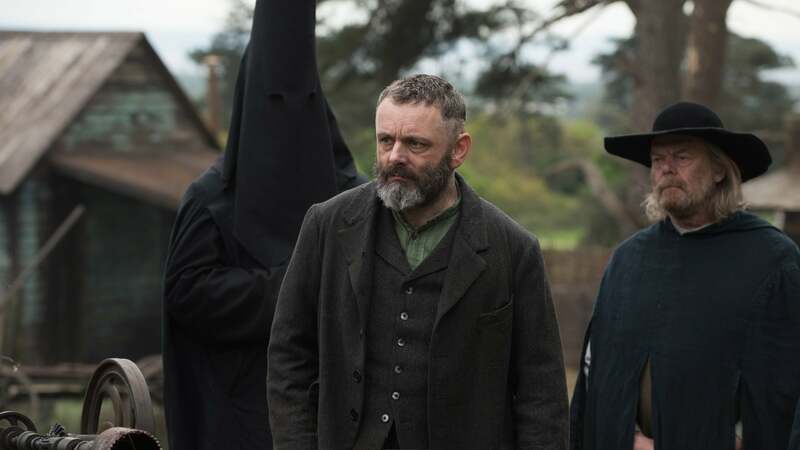 Apostle offers a lovely build of terror and suspense as Thomas traverses the mysterious island watched closely by the cult leader Prophet Malcolm, Michael Sheen. We are left wondering WTF is actually going on, if Thomas’s sister is still alive, and just how Thomas can save her if she is. Along with the seemingly quiet and obedient congregation, the we learn that the island is inhabited by some other-worldly creatures as well. Overcome by paranoia and desperation, the cult elders begin to turn on each other resulting in some of the most horrific torture scenes I have scene in a movie! This is where the suspense pays off in Apostle and it truly becomes a horror film. It’s definitely worth a watch!!! Thanks for stopping by and check back for 1 more DAY OF HORROR!! Happy 29th Day of Halloween!!! We are into the final countdown for sure now!!! Only 3 days left!!! To make this last Monday a special one I offer up 2018’s Mandy!!! I had heard so many people raving about this flick all over social media, that I had to sit down and see what the hype was about! Nicholas Cage, Red, and the love of his life, Mandy, Andrea Riseborough, live in the middle of nowhere utopia. Intensely in love with one another, it seems that the whole world just glows around them. It wouldn’t be a horror flick if the movie went along like this for too long though. Enter the drugged up hippy like cult that fucks with the wrong couple! The movie quickly flips to a post-apocalyptic drugged fueled, ultra violent, live action anime! The vibrant colors used remind me of the giallo genre mixed with a dark anime. think Suspiria meets Urotsukidoji!! Plus… how can you go wrong with a chainsaw battle?? Nicholas Cage’s performance is heart wrenching and equally frightening, a truly brilliant casting job! The entire cast shines bright even against Cages remarkable performance. Mandy‘s manic, epic, blood soaked journey warrants…. It is truly a must see flick for horror and anime fans alike!! Thanks for stopping by and check back for 2 more DAYS OF HORROR!! Happy 28th Day of Halloween!!! Today’s movies selection is 2013’s Contracted!!! Another horror movie warning of the dangers of promiscuity!! Our lead, Samantha, Najarra Townsend, has a regretful one night stand at a party and her life starts to fall apart! Contracted gives us a unique twist on the zombie story line in that we get to witness and experience Samantha’s “transformation” right along with her. From the changes in her appearance to her erratic emotions, it’s a fun take on a worn out genre. We even get a few good super creep out moments! Thanks for stopping by and check back for 3 more DAYS OF HORROR!! Happy 27th Day of Halloween!!! We are a mere 5 days away from HALLOWEEN, so to celebrate I give you 2016’s The Belko Experiment!!! The true horror story here is working for the man! LOL!! The Belko Experiment asks the question, how well do you know your employers, and your fellow co-workers!? Our movie starts out as a normal day at the office, until a voice comes over the loud speaker letting everyone know, that they’ve got to kill a few fellow employees or run the risk of dying themselves! With every window and door locked tight, our happy “work family” is forced to turn on one another in a sick and twisted game of survival. Next comes 60 minutes of every man for themselves, with a few “Survivor” type alliances being formed, and plenty of bloody good violence!! What starts to come out are your typical office tensions, a budding romance, the resentment of a fellow employee, the hatred of an over bearing boss, etc. Nothing that’s too surprising, but entertaining enough. Thanks for stopping by and check back for 4 more DAYS OF HORROR!! Happy 26th Day of Halloween!!! For this super special last Friday before Halloween, I offer you a tasty, terrifying undead, treat, 2016’s South Korean, fast paced zombie flick, Train to Busan!!! Train to Busan finds a father and daughter aboard a train as a zombie apocalypse hits! Not having been the most attentive dad, this may very well be his last chance to show his daughter how much he truly does care. Giving us a new, unique version of the past paced zombie, Train to Busan, hits the pedal hard from the jump and never lets up!! The rapid transformation of the zombies, makes for a roller coaster, edge of the seat hugging zombie flick, horror fans have been craving!! This coupled with the social commentary it plays up between social classes, and just how humanely people act when put in life and death situations, gives Train to Busan a real fresh feel on a played out genre. Even with the use of some CGI, this flick never felt fake, my common complaint about CGI. Every scene was well placed and seamlessly edited in! All this praise having been deservingly given, Train to Busan did let me down, as many a horror flick does, in the very last few minutes! There is an unnecessarily saccharine moment that tries to soften the blow of this otherwise hard hitting flick! Thanks for stopping by and check back for 5 more DAYS OF HORROR!! Happy 25th Day of Halloween!!! To celebrate our very last week before Halloween I offer up The Voices!!! That’s right, THE Ryan Reynolds, of Deadpool fame, is the star of this delicious horro-medy!! A sweet, mild mannered, Jerry is just trying to work his 9-5, make friends and get out there and find love! The only problem is he’s off his meds, and finds himself very susceptible to the suggestions of his pets!! We’ve got Jerry’s own personal devil on his shoulder, Mr. Whiskers, and his angel pooch, Bosco! Both of which are voiced by Ryan Reynold’s as well!!! Is there nothing this fabulous man can’t do?? Jerry really starts to get into trouble when he begins taking the advice of his wicked kitty, and ends up with bodies dropping all around him!! Miraculously enough, I actually found this flick strolling through one of the only video rental stores still surviving out tech obsessed world! As always, Reynold’s does not disappoint, and his supporting cast of Gemma Arterton, as Fiona, and Anna Kendrick, as Lisa just add to the credibility and hilarity of this film!! This coupled with the delicate manner the movie deals with mental instability. Thanks for stopping by and check back for 6 more DAYS OF HORROR! !